The Colichemarde emerged on the sword scene in the late 1600's during the decline of the Rapier and the rise of the small sword. Its strong suit was its uniquely shaped blade that was extra wide at the forte then stepped down or narrowed for the rest of its length before ending in a wicked point. The advantage of this configuration was it allowed the sword to be used to parry or oppose even the heaviest weapons without breaking, yet remain light and supple enough to take full advantage of its lightning quick point. True to form, our blade mirrors the original design concepts with an extra long and wide forte that abruptly tapers down to an acute and deadly point. The hilt features a decorative, yet highly functional, double shell guard, complete with finger loops and bow, while the grip is completely wire wrapped and capped with a matching pommel. 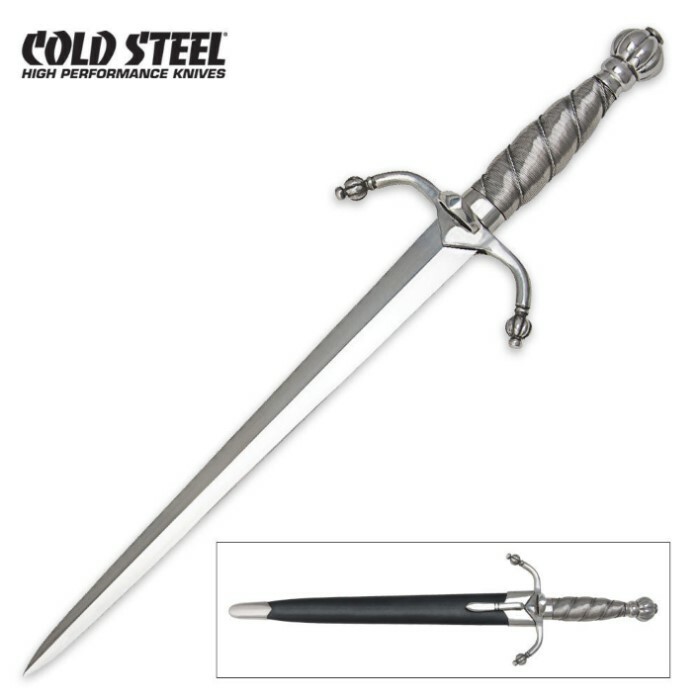 Additionally, we have also taken the liberty of creating a matching dagger with a stiff, beautifully ground and polished blade, double quillons, and wire wrapped handle. Blade Length: 11 3/4 in. Overall Length: 17 3/4 in. Scabbard: Leather Scabbard w/ Steel Fittings.